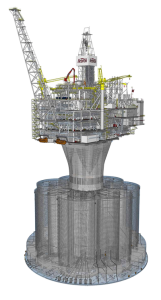 A GBS (gravity-based structure) is a massive concrete-based construction used as an oil or gas platform, relying on its sheer mass and gravity to remain in place. The second-phase of GBS construction for the Exxon Mobile-run Hebron oil field (located offshore Newfoundland and Labrador, Canada) is currently in progress, with the finished megastructure designed to be able to store approximately 1.2 million barrels of crude oil. Score has appointed Hobbs to supply triple offset butterfly valves to the structure, which is being engineered at the Bull Arm yard in Newfoundland – when constructed it will be towed into location and sunk in place in the 92m deep water. The enormous platform will be capable of withstanding sea ice, icebergs and the harsh environment of the North Atlantic. Successful oil platform operation relies on the pumping and storage of large volumes of liquid, hence Hobbs Valve being selected as the valve supplier to this massive project. Hobbs’ triple offset butterfly valves offer zero leakage (unlike traditional butterfly valve configurations) and are both space and cost-saving. In addition, if any maintenance work is required they can be disassembled and reassembled with incredible speed. Hobbs was appointed to the project following its successful delivery on the first phase in 2012.